Serving Oshkosh and the surrounding area since 1976, we have earned our exceptional reputation by providing customers with what they expect: honesty, integrity and the highest quality of construction. We provide free consultations and welcome the opportunity to bid your plan. 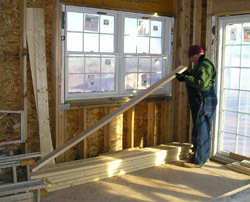 confidence that your building or remodeling experience will be stress free. Are you still in the "thinking" stages or unsure as to whether building or remodeling is right for you? Then let us discuss your ideas, show you floor plans, and work with you in designing something that can turn your thoughts into reality. No jobs are too big or too small...call us today!